Photo taken at Bosque del Apache NWR in 2016. I'll be there the following week, can't wait. 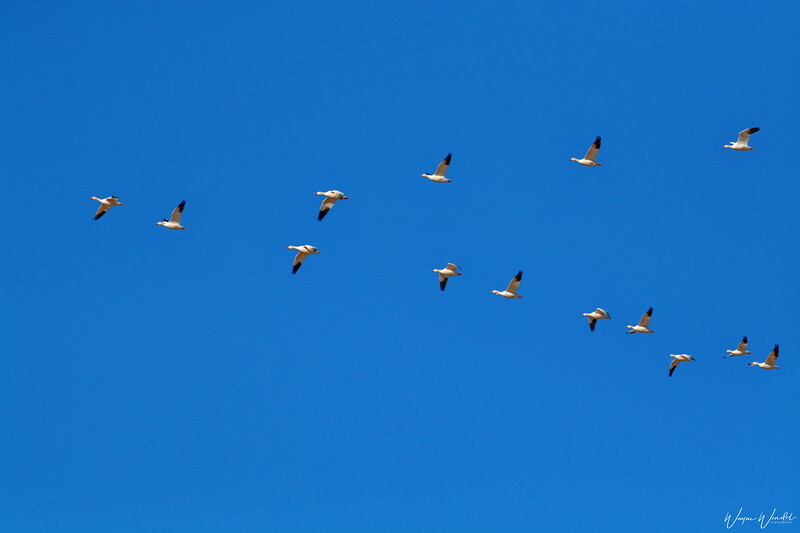 Geese fly in a "V" formation for several reasons. It conserves energy. Each bird flies slightly above the bird in front resulting in less wind resistance. The birds take turns being in front, falling to the back when they get tired. It enables the to fly longer distances by flying a a "V". Bosque del Apache NWR is winter home to around 30,000 Snow geese. They are an awesome sight and sound when they lift off the water in the morning headed for planted fields to eat. Terrific V! We see them pretty often but I am usually in the car and rarely get a shot off. Excellent capture!!!! I've been seeing a number of these formations in the sky recently. Super V. I've never been to Bosque del Apache, but I really would like to go some day. Have a great time, and I can hardly wait to see your photos. Nicely done. Would never have thought of that one. Great shot. Best of luck next week at the Bosque! Thanks for the comments, have a fantastic day.